Go to the YA Scavenger Hunt page to find out all about the hunt. There’s a BUNCH of contests going on simultaneously, and you can enter one or all! I am a part of the BLUE TEAM–but do check out the other teams for a chance to win a whole different set of books! Today, I am hosting GINA DAMICO on my website for the YA Scavenger Hunt! Gina Damico grew up under four feet of snow in Syracuse, New York, and has since worked as a tour guide, transcriptionist, theater house manager, scenic artist, movie extra, office troll, retail monkey, yarn hawker and breadmonger. She’s the author of the grim-reapers-gone-wild books of the Croak trilogy (Croak, Scorch, and Rogue), Hellhole, Wax, and Waste of Space, all published by Houghton Mifflin Harcourt. She lives in California with her husband, two cats, one dog, and an obscene amount of weird things purchased at yard sales. 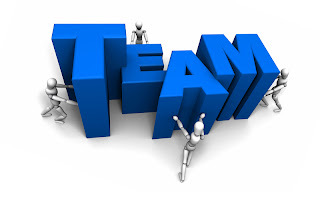 Find out more information by checking out Gina’s website. And now, without further ado, I am happy to hand things off to GINA DAMICO! When I first started writing WASTE OF SPACE, I wanted to show every stage of the reality show production process: concept, development, auditions, the narrowing down of the applicants into final casting interviews, and lastly the reveal of the chosen contestants. The problem with showing all of this – especially in a book and not in some quick-cut TV montage – is that it ran way too long. I soon realized that readers would enjoy seeing some of the process, but ultimately would rather meet the characters who we’re going to spend the rest of the book with as quickly as possible, and not so much the auditioners that don’t make the cut. So I ended up cutting the audition process, which sped things up considerably (and was fairly fitting in a meta way, given the book’s themes about editing and shaping the narrative to fit one’s own agenda). But that means those poor rejected applicants got left on the cutting room floor – or rather, a forgotten file on my computer – so today I’m giving some of them the chance to see the light of day, along with the poor interviewer employed by DV8, the network airing the show. Take it away, weirdos! DV8: What’s your favorite subject in school? #1724: They’re watching us, you know. #1724: Them. Out there. In space. They’re listening to our thoughts! DV8: Is that why you’re wearing a tinfoil hat? #1724: Why else would I be wearing a tinfoil hat? DV8: Come on in, don’t be shy! DV8: Oh, I see. Next! DV8: Sorry, kid—the guidelines specifically said no costumes allowed at auditions. #2971: This is not a costume! #2971: Actually, R2D2 is not a thing, he’s a protocol droid. DV8: Regardless. Take off that helmet. DV8: Come on, kid, I don’t have all day. Are you my 5:15 slot or not? DV8: Oh, for Pete’s sake—I said no! Take your stupid robots and Dark Vaders and get out! DV8: What do you want to be when you grow up? #5890: I was thinking I’d like to be a physicist. DV8: You sure about that? Because let me tell you something—and I know from personal experience—that crowd is seriously lame. #5890: We’re not that lame. DV8: You’re aware that we’re only casting teenagers, right? How old are you? DV8: Prove it. Show me your school ID. It says faculty! You need to leave, sir. 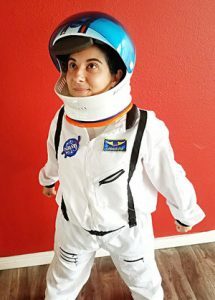 #5890: I want to go to space! Please let me go! These rotten teenagers don’t deserve it. Twenty years in the public school system, trying to teach these Neanderthals—I deserve it! #5890: Don’t leave me here with them! DV8: I can’t help but notice that you’re setting your shoe on fire. Can you please put the lighter away? DV8: For the rest of the interview. So. What do you like to do for fun? #6987: Set things on fire. Patty here… that was awesome! Thanks, Gina. 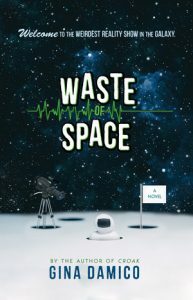 I’m adding Waste of Space to my TBR pile. Readers, don’t forget to enter the contest for a chance to win a ton of books by me, Patty Blount, and more! To enter, you need to know that my favorite number is THREE. Add up all the favorite numbers of the authors on the blue team and you’ll have all the secret code to enter for the grand prize! To keep going on your quest for the hunt, you need to check out the next author, JENNIFER HONEYBOURN! I reeeeaaallllyy wish she had kept those auditions in! That’s hilarious! I could read those all day! The one that made me laugh the hardest was the pyromaniac!!! !